1-Where Did Water Flow on Mars? Where Did Water Flow on Mars? Was there ever life on Mars? Many would like to believe that we used to have relatives who lived nearby. The likelihood that life existed on Mars is higher than for any other planet in the solar system. Because all known forms of life require water, the evidence that water once flowed on Mars is essential to prove that life existed there. Conversely, the possibility of life cannot definitely be rejected unless it is conclusively demonstrated that there was never water in a liquid form on Mars. While GIS cannot, by itself, find life on Mars, it can furnish support for the theory that at some time in the past, water did flow on the Martian surface. The results of National Aeronautics and Space Administration (NASA) missions to Mars suggest that there is water on Mars. However, this water is stored in frozen aquifers and in the ice cap on the Martian southern pole at an average temperature well below the freezing point (-60�C or -70�F) and is therefore unlikely to melt as the result of small fluctuations in temperature. Valles Marineris, close to the Martian Equator, the site of the famous "canals" of the Red Planet, which were popularized by the American astronomer Percival Lowell. In the center of the view is the winding Kasei Valles, which could have been shaped by flowing water. However, the examination of high-resolution images and analysis of Martian geology, as well as the scrutiny of elevation models, may indicate that liquid water was once present on the surface of Mars. GIS can be used to help understand where rivers may have flowed and oceans flourished. 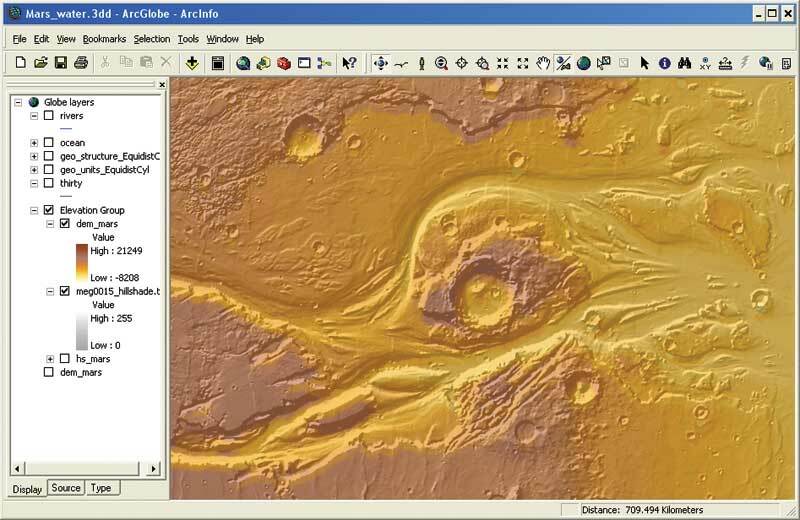 The most critical component of the hydrologic analysis of Mars surface is a digital elevation model (DEM). This Martian elevation grid, referred here as dem_mars, has a resolution of 462 meters/pixel at the equator. It was downloaded from the U.S. Geological Survey Planetary Interactive GIS-on-the-Web Analyzable Database (PIGWAD) (see astrogeology.usgs.gov/Projects/webgis/). 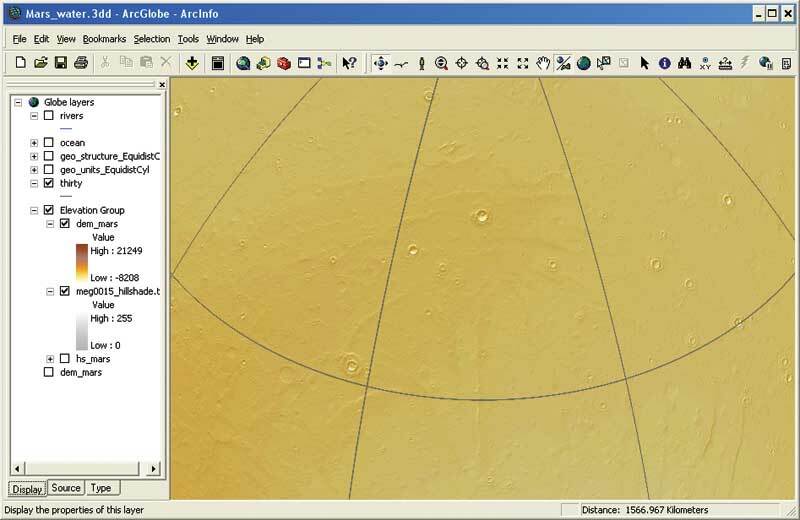 Raw elevation points were gathered by the Mars Orbiter Laser Altimeter (MOLA) between 1999 and 2001. These raw points were processed by the MOLA team, mostly out of Goddard Space Flight Center, into a DEM in 2002. Its spatial extent spreads from 0� to 360� and from 88�N to 88�S. The data used in this hydrologic exercise was downloaded as unprojected data (i.e., a geographic coordinate system, also referred to as decimal degrees). From this DEM, a hillshaded representation was generated to enhance the legibility of the data and enhance visual analysis. Additionally, the global geologic map of Mars was helpful with the analysis. 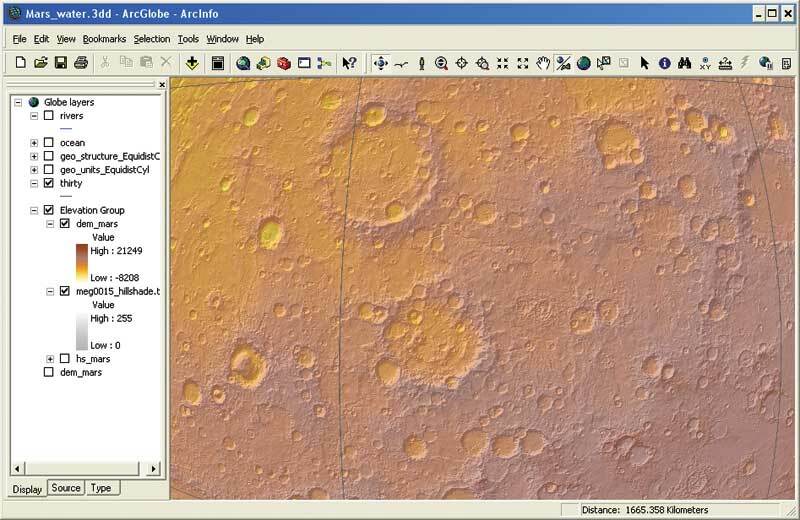 A shapefile of Martian geologic units was also downloaded from PIGWAD. It seems like both erosion and sedimentation caused by running water could have formed this part of the Martian landscape. Linear river valleylike features, some of the most noticeable features of the geomorphologic surface, can be recognized when Martian data is placed on ArcGlobe. Although these features can be found in several areas, Kasei Valles is an outstanding example. The shape of its system of smooth valleys, even at first glance, looks like a river network or a system of valleys created by water erosion. With closer scrutiny, features in the valleys might be interpreted as the result of fluvial forces. Multiple teardrop-shaped bars or islands can be recognized along the riverlike valleys. Their shape indicates that the flow that formed the sandbarlike formations came from the west. If the riverlike network was indeed shaped by flowing water, then it had to follow the basic rules of gravity. Consequently, it would have behaved as rivers do on Earth where water flows from higher to lower elevations, always finding the steepest slope. Streams form networks of tributaries that merge together, creating larger and larger rivers. 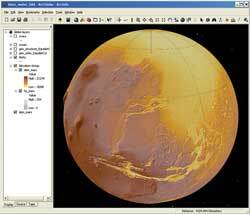 If this were also true on Mars and the elevation of the surface in those watersheds was not significantly altered, then the standard hydrology tools of ArcGIS Spatial Analyst can be applied to Mars. Where fluvial deposits are present, a network of old river valleys can be re-created by transforming the raster network to a vector format linear network using the Stream to Feature function. For this analysis, a selected section of the Martian DEM was treated in exactly the same way that a DEM from Earth would have been handled. A hydrologic network was created by running a series of hydro functions. Although the network appears disturbed here and there by what might have been a meteor strike that occurred after the network was generated and liquid water had disappeared, the general appearance of the ancient Martian stream network is very similar to this kind of network on Earth. Logically, a continuous interconnected network of valleys could only be formed through erosion and sedimentation caused by running liquid that was being pulled by gravity. Technically, lava can also form sinuous channels that appear very similar to water-carved channels, but there is no indication that these network features were formed by a lava flow, rather than the action of water. These relatively large riverlike networks can be successfully generated on only a small fraction of the Martian surface. These locations, taken together, add up to less than 10 percent of the planet's total area. However, many much smaller isolated features that look like they were carved by running water can be found in numerous sections of the planet. Most of Mars' highlands are heavily crateredevidence of bombardment by meteors. These networks didn't empty into one watershed but appear to terminate in many separate basins. Why did these networks end up in the middle of nowhere? Why didn't these rivers continue flowing downhill? One possible answer would be that Martian rivers, like their Earthly counterparts, eventually flowed to an ocean. To support the theory that an ocean existed on Mars, note the existence of areas of high elevation on Mars' surface with numerous meteor craters. These areas of higher elevation are geologically older than Vastitas Borealis, the huge plain that dominates the northern hemisphere of Mars. While Mars has more than 40,000 craters with diameters larger than five kilometers, these craters are not distributed as evenly as would be expected. Why does Vastitas Borealis have far fewer craters than the upland of Arabia Terra, just to the south? The vast lowlands of the northern hemisphere were apparently protected from meteor damage for an extended period. This difference could be explained if at an earlier time the plains of Vastitas Borealis were covered with water, that area would have protected it from meteor strikes. That large body of water could be considered an ocean due to its size. It would have been about the same size as the Arctic Ocean on Earth with a typical depth of approximately 2,000 meters. The presence of an ancient ocean could explain why there are so few craters on the northern lowlands. The relative density of craters shows that the geologic surface of the lowlands is significantly younger than the surface of the highlands. Using the Martian DEM, an ocean layer can be generated based on the current terrain altitude. The upper threshold of 3,900 meters for the hypothetical historical Martian sea level might be considered slightly arbitrary, but this is the best reference currently available. It was established to fit the elevation of the outlets of the previously generated river network. However, some degree of uncertainty can be tolerated because the effects of probable tectonic or other geologic activities of the Martian surface have likely caused the surface elevation in some regions to change since the time when an ocean was present. In addition, the level of a hypothetical Martian ocean in the north had to change. If an extensive body of deep water temporarily shielded parts of the northern lowlands, its shape may have been similar to the one shown here. What happened to this ocean of water is not clear, but researchers agree much water remains on Mars, although it is now all in solid form. A huge ice cap on the southern Martian pole, if it were to melt and be evenly distributed over the Martian surface, would cover that surface to a depth of 11 meters. Evidence of huge sandbarlike features likely formed by running water, remnants of an ancient river network, and the possible existence of a prehistoric oceanalong with the fact that water in solid form is still present on Marsall support the conclusion that at some time in the past, climatic conditions on Mars and an abundance of water could have supported some form of life similar to that which is found on Earth. The author expresses sincere gratitude to Trent M. Hare and James A. Skinner from the USGS Astrogeology Research Program, Flagstaff, Arizona, and Dr. Clive Sabel from Imperial College London, United Kingdom, for their reviews of this article and their helpful suggestions. Witold Fraczek is a longtime employee of Esri who currently works in the Application Prototype Lab. He received his doctorate in the application of GIS in forestry from Agricultural University and master's degrees in hydrology from the University of Warsaw, Poland, and remote sensing from the University of Wisconsin, Madison. 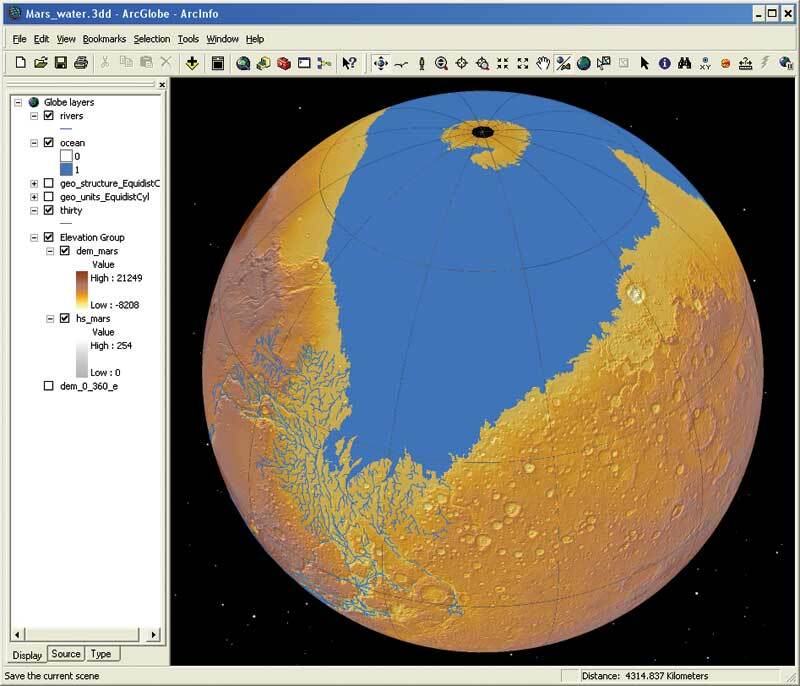 "Going with the FlowUsing terrestrial tools for modeling a Martian ocean"
The USGS has been involved in planetary research since 1963. Originally, this program was started to support lunar geologic mapping and assist in training astronauts destined for the Moon. 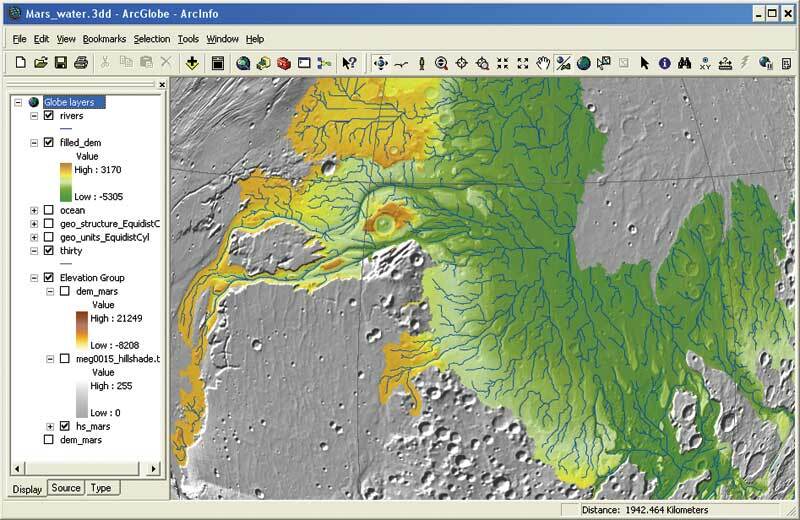 Since the late 1990s, an important part of the research program's operations has consisted of providing planetary GIS support for the scientific community and general public. The USGS astrogeology team continues to share the results of its research and cartographic products with the public through the PIGWAD server at astrogeology.usgs.gov/Projects/webgis/. 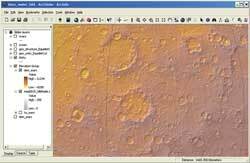 Several other GIS-ready planetary databases, generated by many planetary facilities, are also available for download. In addition to the data, there are maps, tools, scripts, articles, and GIS tutorials related to planetary studies. The data and maps are not limited to the planets but also include the Earth's Moon and the four largest moons of JupiterIo, Europa, Callisto, and Ganymede.